I am building tadpoles trike with "dual crossed drag link" type steering, and having been using the spreadsheets below to get the Ackermann compensation right. I am however not really sure how to get best results. If anybody uses these, or had a more up to date/simpler resource to point me to, do let me know! I am also familliar with the much simpler "point your control arms at the rear wheel", but I am not sure how to apply it to a tadpole trike with drag link steering. Edit: Here's a picture of the Dual Crossed Drag Link configuration. The story about pointing to the center of the rear axle is valid but sometimes you have to set the ackermann a bit of in the positive or negative direction. In my setup the full ackermann works fine. You might be able to solve your problem by making an animation of the setup so you can see the angle that the wheels are making when you turn the handlebar. I tried but I did not succeed in it. Ok, I sort of figured it out. I will unstar my answer for a better one, should it arise! The diagram in my original post is the answer, I just did not understand it. 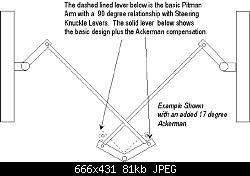 2) Calculate your Ackerman the same way you would with rack and pinion - it is the angle from the center of your rear axle to a front wheel. However this only provides ONE correct solution, out of an infinite number. The arm's "straight" setting can be swung forward and backward, so long as they are parallel. the radius of the arms can be different on the drive and slave*. This can be used limit the steer sensitivity, but affects the correct compensation. So in the end I say: use the method I describe, along with the image in the OP, then use the spreadsheets to experiment with other solutions. I also found a program called "Solve Space" which I have not dug into yet, but is free and can simulate linkages. *If there is better terminology, do let me know. Not the answer you're looking for? Browse other questions tagged recumbent tricycle or ask your own question. How are these trikes able to spin around backwards?